· Is inpatient care too inaccessible to those who need it most? · Do mental health professionals discriminate against mentally ill patients? · Are more stringent measures needed to ensure that patients take their medication? · Is borderline personality disorder too serious to be classified as just a personality disorder? · A woman travels from Maine to Massachusetts because she was ordered by her voice, a spirit called "Crystal," to make the trip. · A foul-smelling and oddly dressed man strolls barefooted into the office, unable to stop talking. · A man delivers insects to his neighbors' homes to minimize the effects of poisonous toxins that he says exist in their homes. Mark Vonnegut, M.D., son of Kurt and Jane Vonnegut, grew up in Barnstable with his sisters and four orphaned cousins. The Vonnegut’s, prior to Kurt Vonnegut’s literary success, struggled financially as well as socially on Cape Cod. Vonnegut recounts his journey through childhood into adulthood; navigating life challenged by mental health issues. He recalls with candor and wit events in his life that include getting into Harvard and becoming a Pediatrician, during which there are periods lost to hospitalizations and battles with alcoholism. This is Mark Vonnegut’s second memoir, followed by The Eden Express. It is enjoyable, funny and wise, as well as quotable. Through his unique perspective, Vonnegut is able to offer the reader insight of a person battling an illness most of us cannot comprehend, while achieving a successful and ambitious professional life. He is an example of how one takes their experiences and becomes a caring and compassionate physician, husband and father; while not allowing the stigma of mental illness to define their life. Mark Vonnegut has many insightful, as well as entertaining thoughts. His ideas hold wisdom that most people often overlook, but are delivered to the reader so well. People struggling with Borderline Personality Disorder face many emotional challenges that often interfere with their relationships. These challenges may lead to everything from conflicts that are resolved quickly, to resolution over a period of time, to long term estrangement. This guide will help people who suffer from BPD, as well as anybody who is feeling depressed, angry, anxious or worried. The authors, who are clinicians at McLean Hospital, use DBT (a form of behavioral therapy) to teach skills that help a person react more effectively to overwhelming emotions. This guide addresses over 50 of the most common struggles people with BPD face, and offer evidence-based solutions to resolving the challenges. The format is straightforward and easy to use. For each scenario there is a Problem Statement (an overview of a situation); What it looks like (an illustration of the problem based on real-world examples); The Practice (specific skills and techniques to that can be applied to solving the situation); Checklist (a list of questions to keep the reader on track with a solution). Although this book was written for people diagnosed with Borderline Personality Disorder, the message and coaching skills communicated in Coping with BPD, are helpful to the common challenges humans face. Parenting a Teen Who Has Intense Emotions – DBT Skills to Help Your Teen Navigate Emotional & Behavioral Challenges. By Pat Harvey and Britt H. Rathbone Published in 2015 by New Harbinger Publication, Inc. Dealing with a teen with intense emotions? Not sure how to respond or help? This book is for you. Written by therapists who have worked with struggling adolescents and their families for decades, this book simply and practically outlines skills and strategies for parents and caregivers of children with challenging behaviors and emotions. Using Dialectical Behavioral Therapy (DBT), they help parents better understand their teen and how best to respond to problem behaviors using effective and balanced parenting strategies. The book specifically addresses anxiety issues, eating disorders, self harm and disruptive and risky choices. This book addresses the impact of a child with challenges on the family including extended family members and siblings and how best to cope. It is written with an attitude of acceptance and is not about finding fault or blame. DBT, developed by psychologist Marsha Linehan in 1993, was initially developed to help people with intense emotions that lead to self harm and suicidal behaviors. Now, an evidence-based therapy, it is widely used to treat many kinds of mental health issues. DBT skills and strategies are based on the concept that people need to be accepted and that they are doing the best they can in that moment. DBT skills help people replace unhealthy behavior with more adaptive ones. Dr. Fruzetti's describes how using dialectical behavioral therapy (DBT) skills can help couples deal with out-of-control emotions that lead to destructive fights and difficulties resolving problems. He incorporates the importance of using mindfulness and distress tolerance techniques to deescalate situations before they get out of control. Through years of working with couples dealing with these challenges, Dr. Fruzzetti provides ways to find acceptance and closeness with someone you love. Stacy Pershall is a fascinating and unique character. She grew up in a small town in Arkansas, struggled with bulimia and anorexia throughout her teens and she experienced her first manic episode at eighteen. After a suicide attempt which she broadcast live on her webcam, she wanted her life to change. Pershall chronicles her tumultuous journey through the mental health system and how body modification through tattoos helped in her recovery. A testimony to the effectiveness of Dialectical Behavioral Therapy, this quirky memoir effectively illustrates how often a primary or secondary diagnosis of borderline personality disorder would change the course of treatment and prevent over prescription of medications that do not help. Note: Borderline Personality Disorder rarely occurs alone and often exists in combination with other disorders such as depression, substance abuse or bipolar disorder. The Illustrated Happiness Trap is a simplified illustrated version of the bestseller, The Happiness Trap also by Russ Harris. Using clever, descriptive drawings it provides a great tool to become familiar with Acceptance Commitment Therapy (ACT) prior to reading the original and longer version or act as a refresher for anyone trained to use ACT. Acceptance Commitment Therapy is a widely used and is based on two main principles, mindfulness and values. Used together, ACT helps deal with painful feelings and thoughts to ultimately create a fuller, more meaningful life. In this illustrated version you will learn what mindfulness is and what skills need to be learned. Through "defusion", expansion and connection the book illustrates how to start living in the present instead of worrying about the future or thinking about the past. With ACT you learn to focus on how your values give your life purpose, meaning and direction. 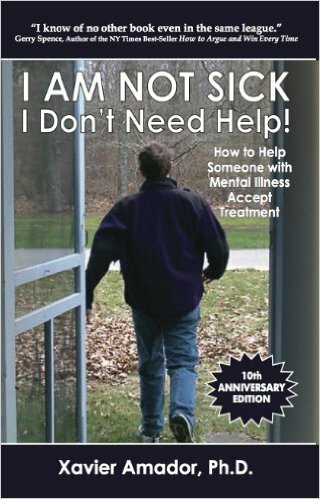 is indeed "The Indispensable Guide to Today's Most Misunderstood Illness" as it is billed. This is the 6th Edition by Dr. E. Fuller Torrey, the world's leading expert on schizophrenia, who includes over 30 years of both personal and professional experience along with the latest research findings on what causes this insidious disease as well as information on the newest medications. The book is filled with both neuroscientific facts, common sense advice, and answers to the questions families are often too upset or afraid to ask. "It should always be remembered that the behavior of persons with schizophrenia is internally logical and rational; they do things for reasons that, given their own disordered senses and thinking, makes sense to them"
Psychology Today writes that Surviving Schizophrenia is a "comprehensive, realistic and compassionate approach...Should be of tremendous value to anyone who must confront these questions." In Furiously Happy, Jenny Lawson explores her lifelong battle with mental illness. A hysterical, ridiculous book about crippling depression and anxiety? That sounds like a terrible idea. Like John Hughes wrote in The Breakfast Club, 'We're all pretty bizarre. Some of us are just better at hiding it.' Except go back and cross out the word 'hiding.'" This is a book about embracing everything that makes us who we are - the beautiful and the flawed - and then using it to find joy in fantastic and outrageous ways. Because as Jenny's mom says, "Maybe 'crazy' isn't so bad after all." Sometimes crazy is just right. Resilience is a powerful and compelling true story written by Jessie Close and Pete Earley and published earlier this year. In spite of a life of privilege and opportunity, at 15 Jessie’s life started to fall apart. Not properly diagnosed or treated appropriately until she was almost fifty, she writes of an out of control life of addiction, failed marriages and the struggle to help her son with mental illness. Jessie is the younger sister of Glenn Close, an award-winning actor. Glenn contributed several chapters to the book and writes candidly that the family never understood what was happening. It wasn’t until Jessie feared she would take her own life that she opened up to her family and was given the proper treatment. In recovery, and frustrated with the stigma she and her family faced with a mental heath diagnosis, Jessie asked Glenn for help. In response, Glenn created a public service announcement entitled, “Change a Mind About Mental Illness”. It was directed by Ron Howard and was filmed inside Grand Central Station. The film begins with hundreds of passengers hurrying through the crowded lobby. In pairs, people slowly start to appear wearing white T-shirts with blue lettering. Against the dark clothes the others are wearing the white T-shirts stand out. The first pair read MOM and SCHIZOPHRENIA, the next two PTSD and BATTLE BUDDY; the next pair was DEPRESSION and BETTER HALF. Jessie Close’s son Calen appears with two young women. Their T-shirts read SCHIZOPHRENIA, SISTER and COUSIN. The T-shirts that Glenn and Jessie were wearing read BIPOLAR and SISTER. At one point Glenn puts her arms around her sister and says, “Change a mind about mental illness and you can change a life.” In the last moments of the PSA the white T-shirts change to dark colors so each person blends into the crowd. Among the many messages the PSA delivers, it encourages us to support and stand up for our friends and loved ones who have a mental illness and to work to end the stigma. Since the PSA first aired in 2009, Jessie has continued to work to end the stigma associated with mental illness and has received many awards honoring her efforts including one from NAMI. Jessie writes a regular blog for BringChange2Mind.org, an anti-stigma organization started by Glenn. Pete Earley is the author of Crazy: A Father’s Search Through America’s Mental Health Madness and has been a longtime advocate for mental health reform and a supporter of NAMI. Women throughout the ages have been knitting blankets and articles of clothing. That they enjoyed the process or the camaraderie if they knit with others, was a side benefit not to be taken seriously. The book is filled with illuminating and thought provoking quotes from both knitters and clinicians. In addition, there is a website ( www.stitchlinks.com) which provides free access to information, research and a community of fellow knitters. When it was released a few weeks ago, I immediately grabbed a copy of this book for two reasons: number one, I am a Springsteen fan and have been for decades and number two, I had read a review that spoke about Springsteen’s going public concerning his lifelong struggle with mental health issues including major depressive episodes. The purchase was money well spent and I got much more from the book than I had anticipated. In addition to being extremely well written, the book delves into not only the historical development and evolution of rock and roll and Springsteen’s iconic role, it also provides a great deal of insight into the postindustrial wastelands of this country, a development we need to understand as we come to terms with the deep divisions and extreme anger that became evident in the 2016 presidential election. Bruce Springsteen came of age in this era in an environment negatively affected by the changing economics and culture of the late 20 th Century. His angry and brooding father (in his later years diagnosed with schizophrenia) was a victim of these changing times. Springsteen also publicly lays out his own decades long battle with mental illness in a very honest and thoughtful way. We see Springsteen in a different and even more serious role as he relates his feelings as he is “Born to Run” from his demons, his fear of failure, his mania, and his depression. (He publicly acknowledges his therapist and his 30 years of psychotherapy.) He examines his relationships with parents, grandparents, siblings, wives, his children, the members of the E Street Band, his audiences, and his business managers with brutal honesty and often with self-degradation. There is so much to be contemplated in the reading and digesting of this book from the cultural history of rock and roll to the changing landscape of American life to the agony and pain of living a volatile, yet highly successful public life while suffering severe mental illness. The book is divided into five sections. Each section addresses a specific relationship to the dying person. She looks at when a partner dies, when a parent dies, when a sibling dies, when a child dies, and facing one’s own death. Each section then describes two or three clients and their specific grieving experience. This aspect of the book makes it a difficult and sad read. The experience of each client, or couple or family is real. Following these descriptions the author reflects upon their experience and the specific grieving relationship. In the course of the book Samuel describes grief as a natural and necessary process that needs to be faced. As each person and relationship is different so is each experience of grief. She writes, “I have regularly seen that it is not the pain of grief that damages individuals….and even whole families, sometimes for generations, but the things they do to avoid that pain.” She further discusses the difference between men’s and women’s experience of grief and touches on the role of anger in our grief. Samuel discusses supporting bereaved children. She talks about the importance of being honest with children and including them in the grieving process. The author is founder of Child Bereavement UK and you can find additional material and advice at their website https://childbereavementuk.org. The section on when a sibling dies includes a discussion of suicide. Grieving in the face of suicide is often much more complex and prolonged. Megan Devine is a former therapist and now writer and speaker on the topic of grief. She herself suffered the tragic accidental loss of her partner of many years. Through her own painful experience of grief, as well as, the experiences of many she has worked with, she now provides a discussion of how to care for oneself during this most difficult time and how others can support people in their grief. She makes it clear that grief and the pain it brings is a normal and natural response to loss of a loved one. In the same way that each love is different, each experience of grief is different as well. The pain of grief is not something to be fixed. It is not a problem to be solved. While others cannot fix it or diminish it, we can be present to love and support the grieving person and help them bear their pain and loss. The book is written for both those that grieve and those that want to help. Besides describing the author’s own experience, the book provides the written experiences of others through the author’s “Writing Your Grief” workshops. She also includes many “Try This” questions as tools to help people dealing with their own grief. Devine devotes several chapters to our society’s culture of grieving. Our culture is full of misunderstandings regarding grief which more often than not make the grieving person suffer more, not less. These misunderstandings include seeing grieving as a problem that needs fixing, finding blame for someone’s loss, and expecting people to get over their grief and return to normal. Society also has expectations about how long one should grieve. Indeed from a medical standpoint longer than six months of grieving becomes a problem. It is so unkind to have expectations about the length of grieving. Just as the depth of love is immeasurable so is the depth of pain of grieving. Indeed, for many there is no time limit. Life never returns to what it was before. It is forever changed. I’m also glad that Devine addresses the issue of stages of grief. Dr. Kubler-Ross wrote about the stages of dying. People then extended this to grief and developed an inappropriate expectation of stages in grief. The appendix to the book is an essay by the author titled “How to Help a Grieving Friend.” If you wish, it can be found on the internet at refugeingrief.com/help-grieving-friend. Better to pick up the book and read it. It is truly valuable.